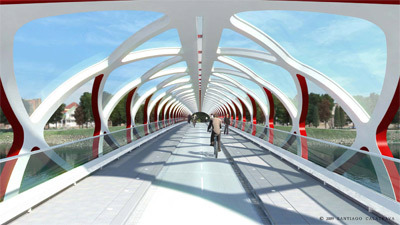 CALGARY – The newly released design for the city’s new pedestrian bridge has been derided by some Calgarians as a gaudy red waste of $24.5 million, and praised by others as a sleek, elegant contribution to downtown Calgary. A red and white drinking straw lying across the river might be dramatic but it has no place in this otherwise beautiful, natural setting. It’s just jarring to look at, and it’s not built to last, so the future costs of repair and replacement make this a terrible use of public money. There are bridges of all sorts in the UK and Europe that have lasted for hundreds of years and this site deserves better, much better. This Bridge is only possible in drawings and video animation. Nothing is realistic about this so called bridge.It’s comparable to a cartoon creation. will encounter lots of headache and cost overruns. I feel sorry for all the Calgarians who will bear all the cost of this waste. As a senior architecture student, this design is actually quite disappointing. It just doesn’t fit the site. Here’s a fine example of a project that should have been opened up to a competition. And if the City of Calgary has its heart set on a Calatrava design, then they’d best ask him for a few alternative designs before settling on one.